Payment Instructions: Verify billing (credit card) and shipping information on Proxibid are accurate to avoid additional costs and prevent shipping delays. Purchases of $5000.00 or more can be paid via wire transfer. Credit cards currently on file with Proxibid will be charged for your purchased items within 24 hours upon completion of the auction. All merchandise must be paid in full prior to removing from the auction site. Nebraska residents (and local out-of-state buyers picking up items) are subject to 7% NE sales tax. In order to be considered tax exempt, a Nebraska form 13 must be on file with Auction Solutions, Inc. Vehicle(s) titles are held until payment clears. Contact the Auction Company prior to the auction close if you plan to pay by any method other than the credit card on file with Proxibid. Declined cards are subject to a $35.00 administrative processing fee and may affect the ability to bid on future auctions. Unclaimed items will be considered abandoned 5 days following the auction close. A 20% re-stocking fee will be assessed, and the item(s) resold. NO REFUND WILL BE ISSUED. Postage and handling charges will be billed separately once items have been packed and prepared for shipping. Checkout Date & Times: Winning bidders will receive a detailed email with the paid receipt. See 'Auction Details' for specific pick up times. Please make sure to pick up during this time frame as an administrative fee will be charged for scheduling alternate pickup times. 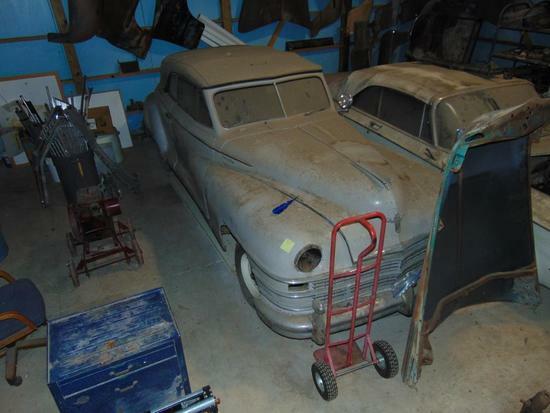 1948 Chrysler Windsor 2-Door Convertible Project. This car is solid with minimal rust. The original engine and 6-cyl. transmission are included, but not installed. This car is 85% complete and does have a title. 1963 Chrysler Newport 2-door Convertible. This great project car has a ton of potential. The dashboard is not installed, but is included. This car has a good title, and is 95% complete. 1946 Chrysler New Yorker. This car has a V-8 engine and has had the center of the roof skin removed. You've been outbid to 7****3! to YOU! Prime Mover Model SN-30 3000 lbs walk-behind outrigger pallet lift with 124 inch mast. This lift comes with battery and charger. It has not been operated for some time and the battery may need repaired or reconditioned. This unit sells AS IS. This lot contains a huge collection [5000 sq. ft.] of vintage automobile parts. This lot is sold for one bid, one money, winner takes all. This is literally a lifetime collection of vintage parts including Chrysler, Ford and Mercury sheet metal, chrome, glass and mechanical from the 1930's thru the 1960's. These parts are new vintage replacement parts, new old stock, used, rebuilt and reproduction parts including complete interiors, seats, door panels, instrument panels, hardware, fenders, hoods, sail panels, tail and headlights and almost anything you can think of in this virtual plethora of vintage American iron.